Will people ever be able to fully control the weather? 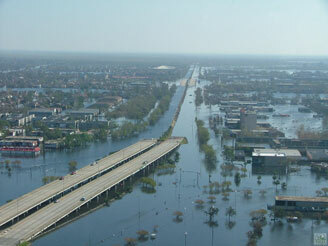 As New Orleans continues to recover from its failed levees, Central California is bracing for disaster with its aging levee system, and the Netherlands is leading the way for flood control. People  and their groundwater usage habits  are the source of a hazard that is threatening homes and people in Western states, in which small cracks in the ground grow to enormous sizes. Modern-day cloud seeders have new technology on their side, but still have a long way to go before proving their science works. The Three Gorges Dam is fueling controversy in Asia. Disclaimers and reduced funding are challenging the publics exposure to science in U.S. parks and museums. New laws are better protecting Oregonians from seismic hazards, but passing the legislation was a lesson in persistence and education. All citizens  including and especially politicians  need to become well-informed on scientific issues before addressing some of Earths most vexing problems. Crater lake region or glacier  scientists have a lot to consider in choosing the perfect landing site for the next robotic mission to Mars. President James K. Polk signs the Smithsonian Institution Act, creating the U.S. museum system from the money bequeathed by Englishman James Smithson. Green flames shoot from wingtip tanks that will seed clouds in North Dakota with silver iodide. 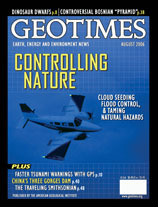 Although cloud seeding in the United States is popular for everything from increasing precipitation to dispersing fog, it still lacks scientific consensus over its results. Read the story in this issue (Print Exclusive). Photo is by Peter McBride/Aurora/Getty Images.